If you are using the Azure App Service to host your web site and you want to connect to an on-premises server then there a number of ways you can do this. One of the simplest is to use the hybrid connection. Hybrid connections have had a bit of a revamp lately and they used to require a BizTalk service to be created, now you just need a Service Bus Relay. You can generally use the hybrid connection to communicate to your back end server over TCP and you will need to install an agent on your server (or a server that can reach the one you want to connect to) called the Hybrid Connection Manager (HCM). HCM will make an outbound connection to the Service Bus Relay over ports 80 and 443, so you are unlikely to need firewall ports changing. Hybrid connections are limited to a specific server name and port and your code in the Azure App Service will address the service as if it was in your local network, but will only be able to connect to the machine and port configured in the Hybrid Connection. Instructions for configuring your hybrid connection and HCM are here. I have setup a number of the old BizTalk style hybrid connections and the new way is a lot easier to do. I ran into a few connectivity issues when I first created the Relay hybrid connection and there were a few things I found that helped me to find out where the issues were. Firstly the link I provided to configure the hybrid connection has a troubleshooting section which talks about tcpping. You can run this in the debug console in Azure and it will check to see if your HCM is talking to the same relay as the one in your app service. To get to the debug console, log in to your azure portal, select the app service you want to diagnose. Scroll down to Advanced Tools and click Go. The debug console will allow you to browse and edit files directly in your application without the need to ftp. This is really useful when trying to check configuration issues. This all checks that you are connected to the relay, the final thing you need to check is whether you can actually resolve the dns of the target service from the server where HCM is running. This needs to be the host name of the server and not the fully qualified name. This also needs to match the machine name you configured in the hybrid connection.The easiest way to do this for me was to put the address of WCF service I wanted to connect to into a browser on the machine running HCM. Hopefully I’ve given you a few pointers to help identify why your hybrid connection does not connect. When creating a subscription to an Azure Service Bus Topic you can add a filter which will determine which messages to send to the subscription based upon the properties of the message. Where strFilter is a string representing the properties that you want to filter on e.g. // Create a "LowMessages" filtered subscription. Applying properties to messages makes it easier to configure multiple subscribers to sets of messages rather than having multiple subscribers that receive all the messages, providing you with a flexible approach to building your messaging applications. When a message is pushed onto a Topic the Service Bus will look at all the subscriptions for the Topic and determine which messages are relevant to the subscription. If it is relevant then the subscription will receive the message into its queue. If there are no subscriptions capable of receiving the message then the message will be lost unless the topic is configured to throw an exception when there are no subscriptions to receive the message. 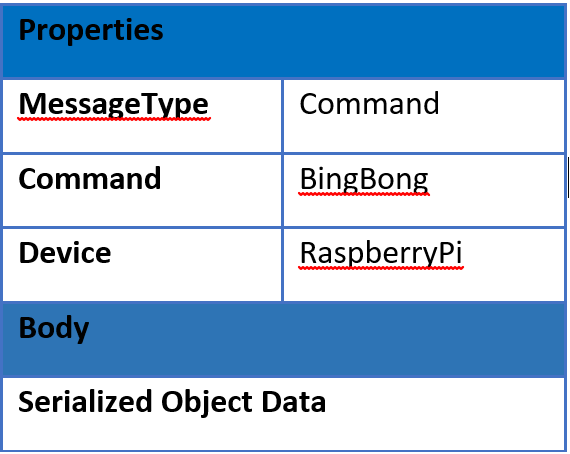 This approach is useful if most of the message data is stored in the properties (which are subject to a size limit of 64KB) and the body content is serialised to the same object (or the body object types are known). Over the past few months I have been looking at RabbitMQ and trying to apply my Service Bus knowledge, as well as looking at the differences. Routing messages based upon the message properties rather than a routing key defined in the message is still applicable in the RabbitMQ world and RabbitMQ is configurable enough to work in this way. RabbitMQ requires more configuration than Service Bus but there is a mechanism called Header Exchange which can be used to route messages based upon the properties of the message. The first thing to do is to create the exchange, then assign a queue to it based upon a set of filter criteria. I’ve been creating my exchanges with an alternate exchange to allow me to receive message that are not handled in a default queue. The code to create the exchange and queue that subscribes to messages where the ClientId property is “Client1” and the FileType property is “transaction”. Again an out of the box feature for Service Bus can also be implemented in RabbitMQ but it is much simpler to use in Service Bus. The use of properties to route messages offers a much more flexible approach but does require that the body of the messages are either not used or are understood by each consumer. Service Bus offers more flexibility as the query string can contain a variety of operators whereas RabbitMQ matches all or some of the header values and not a range. Firstly, what are dead letters? When a message is received in a messaging system, something tries to process it. The message is normally understood by the system and can be processed, sometimes however the messages are not understood and can cause the receiving process to fail. The failure could be caught by the systems and dealt with but in extreme situations the message could cause the receiving process to crash. Messages that cannot be delivered or that fail when processed need to be removed from the queue and stored somewhere for later analysis. A message that fails in this way is called a dead letter and the location where these dead letters reside is called a dead letter queue. Queuing systems such as Azure Service Bus, Rabbit MQ and others have mechanisms to handle this type of failure. Some systems handle them automatically and others require configuration. Dead letter queues are the same as any other queue except that they contain dead letters. As they are queues they can be processed in the same way as the normal queues except that they have a different address to the normal queue. I’ve already discussed Service Bus Dead Letter Queue addressing in a previous post and this is still relevant today. On RabbitMQ a Dead Letter queue is just another queue and is addressed in the same way as any other queue. The difference is in the way the Dead Letter queue is setup. Firstly you create a dead letter queue and then you add it to the queue you want to use it with. Whilst there is a lot of flexibility with RabbitMQ, Dead Letter queues come out of the box with Azure Service Bus. Each topic and queue has one and is enabled by default. RabbitMQ however allows each topic subscription to have their own dead letter queue which allows you to have a finer grained control over what to do with each type of failed message. Now we have these dead letter queues and we know how to access them, how do we get messages into them. In Azure Service Bus, there is a mechanism that will automatically put the message in the dead letter queue if the message fails to be delivered 10 times (default). However, you may wish to handle bad messages yourself in code without relying upon the system to do this for you. If a message is delivered 10 times before failure, you are utilising system resources when the message is being processed and these resources could be used to process valid messages. When the message is receive and validation of the message has failed or there is an error whilst processing that you have caught, then you can explicitly send the message to the dead letter queue by calling the dead letter method on the message object. My test code, above, randomly sends 10% of my message to the dead letter queue. If you look at the code you will see that there are two places where BasicNack is called and only one of them sends them to the dead letter queue. BasicNack takes 3 parameters and the last one is “requeue”. Setting requeue to true will put the message back on the originating queue whereas setting requeue to false will publish the message on the dead letter queue. Both RabbitMQ and Service Bus have the dead letter queue concept and can be used in a similar way. Service Bus has one configured by default and has both an automatic and manual mechanism for publishing message to the dead letter queue. RabbitMQ requires more configuration and does not have the same automation for dead lettering but it can be configured with more flexibility. Have a default handler and then add custom handlers as and when they are required without needing to recode the main system. Be notified if a message is put onto a topic and there isn’t a process to handle the message. Now when a message is published on the main exchange and there is no subscription to handle the message, then the message will automatically appear on the unrouted message queue. This solution will solve both the scenarios we were looking for. I was interested however understanding how to do this in the Azure Service Bus and whilst it is possible isn’t not as straight forward and will require some code to setup. Topics can be configured to throw an exception if there is no subscription available to process the message when the message is sent. So When the topic is created it needs to be configured to enable this exception to be thrown. Note, however, that if you had a subscription that was a catch all (for example logging all the messages) then unhandled messages would not appear as they are already being handled by the catch all subscription. The full code for the sample uses WebClient but I needed to use HttpClient so I converted the samples accordingly. // using the resourceName and an HTTP DELETE request. // Move strings to buffers. This allowed me to send and receive messages on my Raspberry Pi2 using IoT core. I created the subscriptions for the topic using a separate app using the .NET SDK which is cheating I guess, but I’ll get around to converting it at some point. You may want to put a delay in this if receiving the messages causes the app to slow down due to the message loop hogging all the resources. There’s a default timeout in the call to SendAsync and this will automatically slow the thread down. I now have a working Raspberry PI2 that can send and receive message to the Azure Service bus. I’ve created a test win forms app that allows me to send messages to the Service bus and it allows me to control the Raspberry Pi2 remotely. The next phase is to build a workflow engine that hooks up to the service bus and allows me to automatically control the Raspberry Pi. 1. Use public on the main program class.In order for web jobs to initialise correctly the main class that contains the web jobs needs to be made public. Once this has been added the individual jobs can then be read and should be visible in the output when running locally. 2. In order to store and view the invocation details for each web job you need to configure AzureWebJobsDashboard in the configure tab of the website you have deployed the web job to. Even if you have configured this in your app.config file. 4. User TextWriter for debugging. The Azure Web Jobs SDK (see the logging section) provides a mechanism to log out information that can be viewed through the Azure Web jobs dashboard. By adding a TextWriter as an input parameter to your web job method, you can use WriteLine to then output information you wish to log. 5. Make your Blob Triggers more efficient by triggering them using BlobOutput. The mechanism that the BlobInput trigger uses has a 10-20 minute lag before the trigger can fire, but each time BlobOutput is used it triggers a rescan for Blob input. I’m investigating the Azure Service Bus Event Hub using the getting started tutorial and I didn’t seem to be able to receive any data. It turns out that our firewall was blocking an outbound port. After some investigation I found a post which hinted at a port for the on premise service bus. Our IT guys kindly enabled the outbound port 5671 and I now can receive data from the event hub. Internet of Things seems to bring together two of my favourite topics: Gadgeteer and Service Bus. Whilst researching IoT I came across an article in MSDN magazine written by Clemens Vasters (http://msdn.microsoft.com/en-us/magazine/jj190807.aspx). This article is from July 2012 and things have moved on a little since then, but the fact that he has Gadgeteer talking to service bus meant that I had to give it a go myself. The first port of call was the previous article (http://msdn.microsoft.com/en-us/magazine/jj133819.aspx - note the link is wrong in the current article). 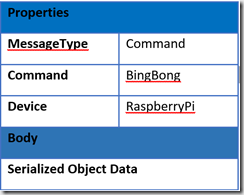 This explains the architecture that the sample is based upon using service bus topics to send commands to the device and a different topic to allow the device to send data. There is also a provisioning service that allows the devices to be initialised with the correct configuration. this provisioning service also configures up the service bus access control service (ACS) to allow each device to have its own security key. This means you can turn off devices using ACS. Before you start take a look at the Service Bus Explorer as this is a useful tool when you are trying to diagnose why things aren’t working. sharedSignature : Go to https://manage.windowsazure.com/ and login. Click on service bus and then select the service bus you are using. on the bottom menu click the Connecting Information button. This will popup a configuration window. there are two keys in here. The first is part of the connectionstring and is under the sas section. Copy the connection string and find the key. This is the sharedSignature for this configuration setting. Microsoft.ServiceBus.ConnectionString: I used the connection string that appears in the SAS section of the connection information popup. The other configuration you need to do is to change the url for the provisioning service. This is hard coded on the Gadgeteer board and is located in Program.cs, serverAddress variable in the ServiceBusApp project. The provisioning service should be ready to go. However, I had problems connecting to the service from the Gadgeteer board as I kept receiving NotSupportedException each time I called GetRequestStream. This was due to an issue with the Ethernet configuration when trying to connect over https. This can be solved by updating the ssl seed using the Fez Config tool (https://www.ghielectronics.com/community/forum/topic?id=13927). This is done by clicking the Deployment (Advanced) button and the clicking Update SSL Seed. Once complete I could then connect to the provisioning service. The provisioning service should only be called once per device and it is up to the device to store its configuration in a persistent store. This did not appear to be working on my device. Some of the settings were being but the topic urls were not. I changed the type from a URI to a string and the persistence then seemed to work and I only went to provision once. Each time the provisioning service is called a new subscription is create and a new access control identity and rule are also created. With all this fixed I could now send messages, but I could not see them. this was because I didn’t have a subscriber to the topic where the data was published. This is easily resolved by creating one, but it will only receive new messages. Any messages sent before the subscription is created will be lost. The provisioning service also has a web page that allows you to send commands to each device. It will broadcast a message to all devices by putting a single message into the devices topic and it sets the Broadcast property to be true. During provisioning the subscription that is created has a SQL Filter applied which allows the subscription to only receive messages that are targeted specifically at the device or if they are broadcast. The web page puts a message into the topic to tell the device to set its temperature to a specific value.The device should be listening for messages to its subscription and will act on the command once it is received. The device never seemed to receive the message even though the Service Bus Explorer showed that the message was waiting in the queue. Whenever we tried to connect to the subscription “Bad Request” was being returned. After investigation is turns out that the sample only ever sets the event topic uri and not the devices topic uri. When we try and retrieve the device commands we are trying to connect to the events topic which is not a subscription. The sample needs modifying in Microsoft.ServiceBus.Micro project in the MessagingClient class. I added an extra Uri to the constructor and modified the CreateReceiveRequest and CreateLockRequest methods to use this Uri. I now have a Gadgeteer device talking to the service bus with the ability to send data and receive commands. My next steps are to create a webjob to process the event data (see my previous post) and also look into event hubs.